We've had an enjoyable set of gigs over the last month. 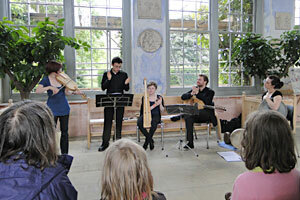 It began with several performances for the family day at Knole House, Sevenoaks. There were lovely audiences and some of them even had a little dance. 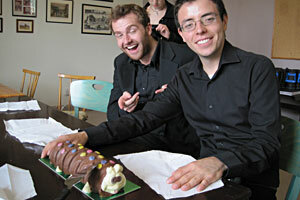 It was also Nic's birthday, so we tried very hard to surprise him with his favourite 'Colin the Caterpillar' cake! The only trouble was that you could only light candles in the courtyard 10metres from the side of the building....but it was very windy and pouring with rain so all the candles blew out! We then gave up and resorted to pretend candles! A few days later three of us had an Artisan trio concert at St Dunstan in the West, Fleet St. It was a well promoted event and had a good audience. We enjoyed it so much that we have just arranged another gig there for next year. We then performed at the lovely Wesley's Chapel near Moorgate. It had nice acoustics and amazing men's toilets - very ornate! We are now busy rehearsing for our Brighton Early Music festival gigs. The Nov 3rd is nearly sold out, so if you're interested, please buy your tickets now.